The 2015 New York Auto Show was held at the Jacob Javits Center in April 2015 with some of the hottest cars and trucks we have ever seen all under one roof. We had more sneak peeks, more brand new ’16 & ’17 production models and more concept vehicles than ever before. Just a few of the amazing new model cars that soon will be hitting our showroom floors. If you are fortunate enough, pop into your local dealership and order one now. This is a Rolls Royce, so you can bet this guy won’t be cheap. Just how much will it set you back? … for $560,000! According to Bloomberg, the Phantom Drophead feels like a living room, which is good, because you might be living in it, for that price. If you’re looking to upgrade your car, look no further than the New York Auto Show, which has invaded the Jacob Javits Center in Manhattan with some of the most dazzling and buzzed-about cars in tow. Of course, many of these vehicles are just slightly out of most people’s price ranges, but that’s what makes the show so intriguing. Ford and Kia share the same floor space as Rolls Royce and Maserati. We hit the show floor this weekend to find some of the hottest cars on display. Some look more futuristic and impressive than others, but all have been making headlines. The show runs until April 12, and is open to the public for $16 per adult. 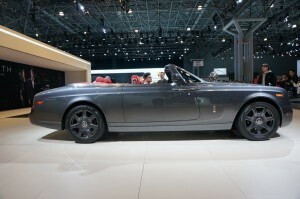 But if you can’t make it to New York, check out the slideshow for the most show-stopping cars on offer. The new Porsche Boxster Spyder is the lightest Boxster to date, the car maker says, helping take it from 0 to 60mph in just 4.3 seconds. When you really get it going, the Boxster Spyder has a max track speed of 180mph. Mercedes is talking up the outside enhancements to its GLE, but for the first time, the car maker will also offer a plug-in hybrid model, the GLE550e 4MATIC. Shown here is the super-fast Mercedes-AMG GLE63 S version. The Audi A3 Sportback e-tron juices up on the show floor. The vehicle can run on electric power, gas, or a combination of the two. BMW’s relationship with Alpina continues with the B6 xDrive, which will set you back more than $118,000. The NY Auto Show is the world premiere of the 2016 CT6. According to GM, the car marks the brand’s return to “premium luxury,” and is one of eight new high-end cars expected by the end of the decade. Tech enhancements include souped-up cameras, enhanced night vision, a rear camera mirror, advanced parking assist, auto braking, and more. For something slightly more affordable from GM, here’s the 2016 Chevy Malibu. The hybrid version features electric power that can support the car up to 55 miles per hour. It flips to the gasoline-powered engine at higher speeds and high loads. Other features include a Teen Mode, which lets parents view their kids’ driving stats, including speed. The Dodge Viper 1 of 1 program, which lets drivers customize their wheels, was announced earlier this year, but Auto Show attendees got a look at some of their creations. Ford is touting the performance technologies in its newest Focus RS, including a new “drift” mode. In a world first, anyone curious about what was on show could take a virtual tour of the New York International Auto Show. Through one of the world’s largest Google Business View tours, you could experience several levels of the show prior to attending the event. In another first, combining the tour and the show could have won you a prize: as you explore the show, be on the lookout for 5 vehicles that you can explore the interior of, plus our start button icons throughout the Show floor. When you find one, tweet us the location with #NYIASTOUR for chances to win an auto show prize. Source: pcmag | Photos by James Jacobsen and Jose Ruiz. The New York International Auto Show is presented by Greater New York Automobile Dealers Association.